A ceremony celebrating the signing of National Letters of Intent by three Warwick Valley High School athletes was held June 6, in the media center. The mid-day event was attended by the graduating seniors’ parents, siblings, friends, teammates and coaches. Catherine signed a Letter of Commitment to attend Cortland State and play soccer for the Red Dragons. Catherine was recruited by Head Coach Heidi Axtell to play for the Cortland Red Dragons as a center midfielder. She chose Cortland over Kings College and the College at Brockport. She plans to study psychology. Catherine is the daughter of Sean and Shauna Smith of Warwick. She has two sisters, sister, Emma, a freshman, and Hope, a fifth grader at Warwick Middle School. Athletes Emily Welling, Catherine Smith, and Lauren Desrats hold up their new college T-shirts. Lauren signed a Letter of Commitment to attend Mount Saint Mary College and compete as a guard for the Knights. She was recruited by Mount Saint Mary College by head coach Mike Coppolino and will compete as a scoring guard. Mount Saint Mary competes in the Skyline conference against teams such as Old Westbury, Farmingdale, and SUNY Purchase. She is the daughter of Jon and Julie Desrats of Warwick. Her sister Kristen is a freshman and a standout basketball and soccer player. She also has a sister, Megan, in grade 7, and a brother, Matthew who is in grade 4. 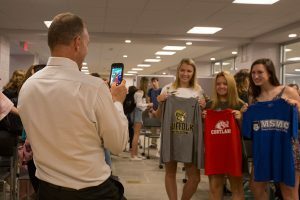 Athletic Director Gregory Sirico takes a photo of the college-bound athletes. Scored her 1,000 point on January 15th vs. Red Hook. Finishes her career with 1156 points. Emily signed a Letter of Commitment to attend Suffolk University in Boston, Massachusetts and compete as a forward for the Rams. She was recruited by head coach Ed Leyden. Suffolk University competes in the GNAC conference against teams such as Johnson and Wales, Emanuel, and Albertus Magnus. Emily is the daughter of Kathryn and Frank Welling of Warwick. Her brother, Morgan, is a sophomore in college pursuing a degree in finance. Member National Honor Society and Sports Medicine Club.